The first film clip of Texas Chainsaw 3D is out, and as you'd expect, it features a kill happy Leatherface running through a creepy graveyard in the night with his chainsaw revving away trying to kill his next victims who have run into a barn. 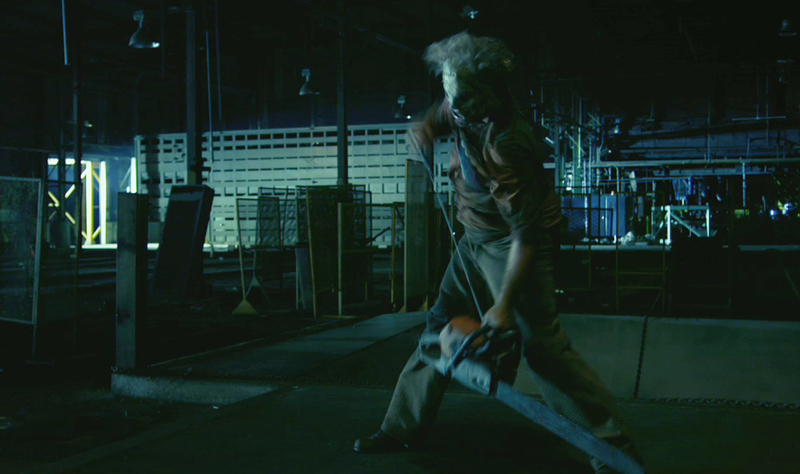 Silly humans, wood doors are no match for a chainsaw! Texas Chainsaw 3D continues the legendary story of the homicidal Sawyer family, picking up where Tobe Hooper's 1974 horror classic left off in Newt, Texas, where for decades people went missing without a trace. The townspeople long suspected the Sawyer family, owners of a local barbeque pit, were somehow responsible. Their suspicions were finally confirmed one hot summer day when a young woman escaped the Sawyer house following the brutal murders of her four friends. Word around the small town quickly spread, and a vigilante mob of enraged locals surrounded the Sawyer stronghold, burning it to the ground and killing every last member of the family - or so they thought. The movie is a direct sequel to the original movie, and it comes out on January 4th, 2013. Several of the original cast members from the first movie have retured for this one including John Dugan who will reprise his role as Grandfather and Marilyn Burns, Bill Moseley, and Gunnar Hansen. It also stars Alexandra Daddario, Tania Raymonde, Sue Rock, Scott Eastwood, Trey Songz, Keram Malicki-Sanchez, Shaun Sipos, Thom Barry, Paul Rae, and Richard Riehle. Check out the clip! TEXAS CHAINSAW 3D - Leatherface is Back in New Photo!